Up to 218mm at Coffs Harbour (Perry Drive AWS) since 9am - not bad for 9 hours. Several other stations on the Mid North Coast have had well over 100mm in the same period. No flood warnings, but there is a flood watch current. 38mm here since 9am. Have had westerly winds since 11am today which certainly shows which side of the trough line we are on! lol, I can see a full moon right now, and the wind picking up, apparently the low off the east coast is just off cape moreton. Dangerous seas, gales are the result of what the bureau says is unusual for this time of year, interestingly looking at the 4 image radar loop of Moree, I can see some sort of rotation going on, what?!?!?! inland? That unusual!! Well that explains it all doesn't it. I thought the rotation was due to the fact of the air being sucked into the low itself, much like an inflow of a thunderstorm, thats how I see it. Some nice winds on the eastern side of that low - double triangles! what's the outlook for it deepening or is it moving too fast to stay over land for any further timeframe? Here in Armidale we have not got anywhere near as much as other place all the way down the coast (although they need it more. Even though we are now drought declared, at the moment we have no water restrictions and no proposals to impose any because our dam is full). The levels of rain seems to have dropped off dramaticaly inland. Even so, we have had non-stop steady rain for a number of days. I measured single figures late last week and over the weekend, then 23mm to 9am this morning. This afternoon at about 5:00 I measured 24 mm in the guage, and it has been steadily raining ever since. Official Armidale Airport figures at 10pm were 45.2mm. It has been cool, but no-where near as cold as June! The Grafton radar image is quite deceiving. It shows Armidale always on the edge of the rain, just missing out on it, only rarely recieving a very light sprinkle from the corner of the rain band. Moree's image isn't much better. I suppose the signal was weakened through the rain band? I can't wait until we get the Tamworth doppler radar. It will improve our coverage here, and give up doppler radar services! 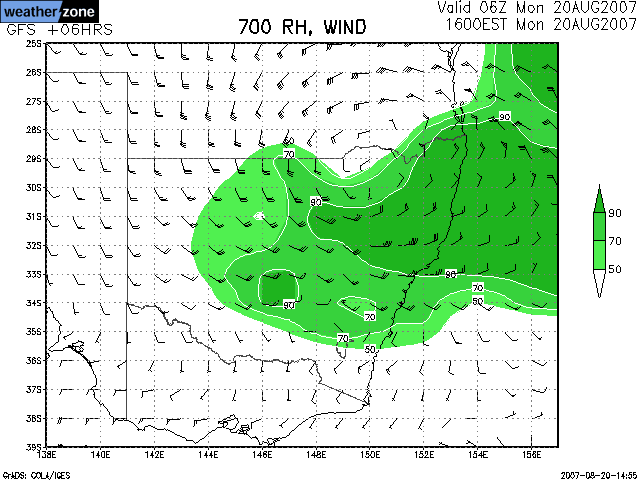 Low is just off the Tweed Coast by the looks. Noticed some clear skies after midnight, but conditions sure changed here just before 5am. From three hours of calm winds to strong S-SE. Moderate to heavy rain has been falling since. Up to 75mm since 9am yesterday. Awesome! The low I assumed is now in a deepening phase or developing nearby. Have not checked the models but is the low anticipated to track down the coast? We awoke to stratocumulus and the odd shower around. 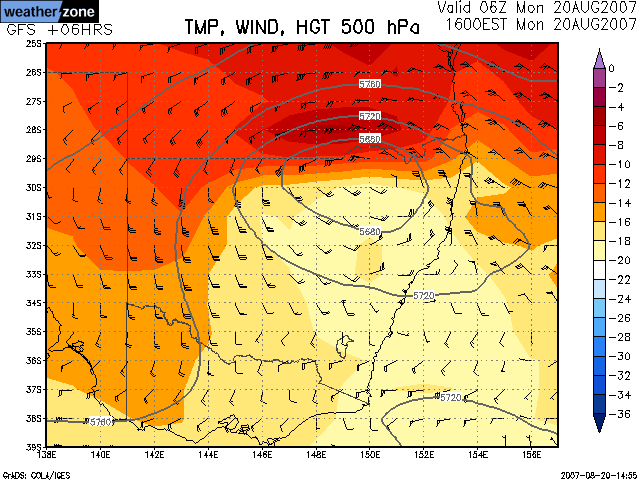 Not sure if the low is deepening but the pressure gradient is certainly tightening with the high pressure west of Tas building. 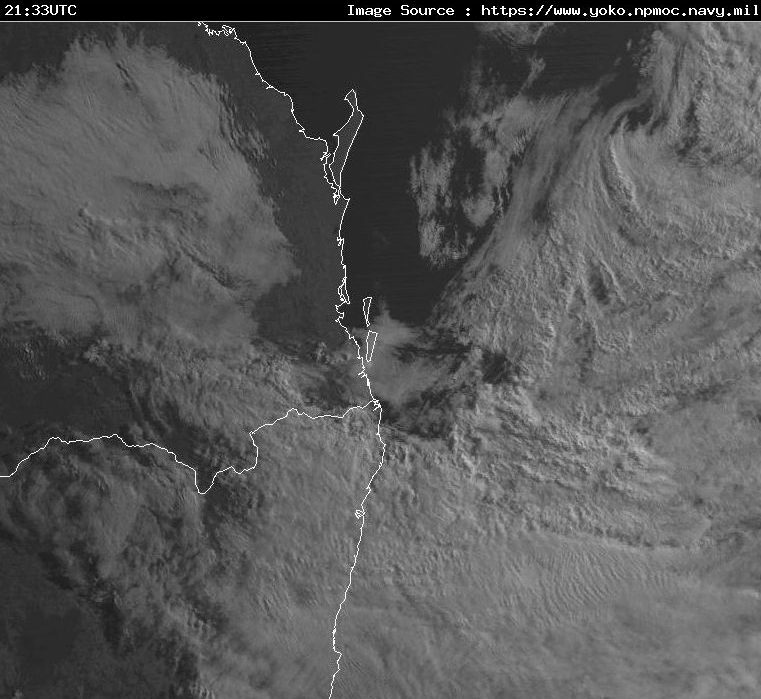 This 8am satpic shows a low well east of Fraser Island, and another one causing the weather just off the QLD/NSW border. This is tipping to edge north-eastwards. Winds are virtually calm near Tweed Heads, but gusting over 100km/h at Cape Byron - a distance of just 50km. 82mm to 9am here, but some isolated falls over 300mm in 24 hours in the Coffs Harbour region. Surprisingly very few flood warnings. Very very calm here, in fact it looks like everlasting type of sunny weather, but very errie. Not a breath of wind or cloud in sight. Yet just 75km away Brisbane and the Gold coast is being blown over, I've never seen this before, so it is very startling. Gales as high as 46 knots are hitting us at the moment, so blowy things are rattling around like crazy, with sustained wind speed of 67km/h I'd imagine theres been some damage. Our power has been flickering, temporary outages, and just plain windy. not much rain wise, we picked up 12mm so far at Maroochydore. Quite scary. Another 46mm here since 9am yesterday, bringing the total at McLeans Ridges to 190mm for this event. No flooding as the rain fell over 72 hours - a real soak in rain event. The strong winds abated during the evening here. Hopefully a lot more rain will fall in the Brisbane and Sunshine Coast areas. Latest GFS is certainly forecasting it. Wind hasn't eased at all since it began yesterday, although rain has eased today. Lot of leave and twig litter around the place, and trying to clean it up is annoying when it more little comes. Our biggest wind gust today was 43 knots, and it has been widely reported of fallen trees and branches.